Not really a new idea. SSTV beacons have been running on linux for over a decade. It’s just showing that the rasPi is still king for tinkering. and on windows for at least 2 decades. JVFax supported all sorts of sstv modes, tried it in 1993 for the first time. For all intents and purposes a raspi is a PC. And it using open source software is hardly new. Always love a bit of sanctimony from a Linux zealot to start the day! LOL those are decent cheap DIP breakout boards from Radioshack, I buy them often, great fit for Attiny45. Haha nice — perfboard will never look the same to me again. Since it’s on 433 MHz, could be used unlicensed inside the 25 KHz channels there? In my opinion you would be better off transmitting via the Ham bands as they tend to have more people listening for this kind of thing. Even if you don’t have a license you can still receive all you want. It makes me wish I had a HT that I could dedicate to being a transmitter for my pi. The photo of this project shows an inexpensive “Cannon” connector. It is an important component that everyone should be familiar with. For those not aware, they can be purchased at most radio shacks. They are excellent! They are really heavy duty, with the locking collar that provides great strain relief. And they are Cheap! With some RTV they can be extremely weatherproof, but still fairly easily disassembled. Their availability at rat shack relates to their use as CB microphone cables. Their use is not limited to CB. Many older and higher-end ham radios use them, as well as many commercial radios. They are a pretty standard connector for radio microphones. Typically, CB mics use the 4-pin version of the connector (the version you’ll find at Radio Shack), and other types of radios use other variants. I think the 8-pin version is most common, at least in my experience. My Icom and Kenwood radios all use them. These can be obtained through HRO (Ham Radio Outlet) and probably other sources. I’m not 100% certain, but I believe they are properly referred to as 1/2″ DIN connectors. You can also find them on eBay as “aviation connectors”. I recently got 10 pairs of the 7-pin variety (for about US$1.13/pair) and used three of them to replace the 0.1″ headers used for axis motor connections on my MaxNC mill. It actually turned out quite slick-looking, and they’ll probably outlast the mill since I won’t be dis-/re-connecting them very often, if at all. Try easypal, it’s digital sstv, incredibly high quality. How does it handle ptt? 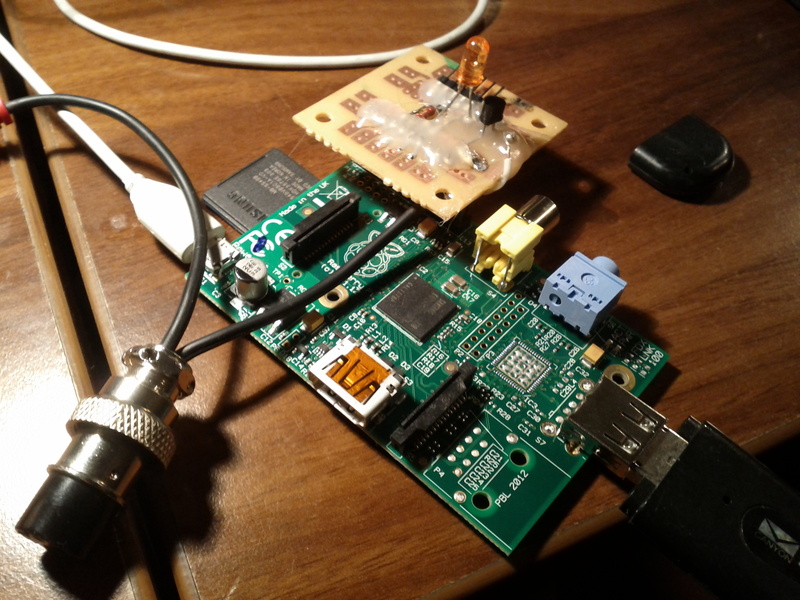 You also can use the Raspberry Pi as transmitter, using PiFM. A great little project for the raspi. This is exactly the combination of software I was looking for. Its great to see this low power consumption computer being used for something ham-radio related. At the time of writing the raspi-2 has been recently released with additional RAM (1 G/B) and a faster quad core processor so doubless this would make digi-sstv a realistic option to. A great project, thanks for sharing.